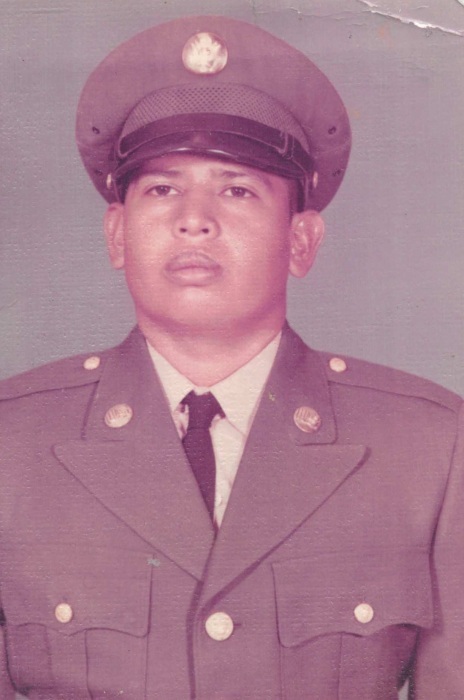 Hilarion Naranjo Jr, 70, of Yorktown, TX passed away Thursday January 10, 2019. He was born April 6, 1948 in Cuero, TX to the late Hilarion and Juanita Ybarra Naranjo Sr. He was a Vietnam Veteran, master carpenter, worked for the Yorktown ISD and was very active in the Seventh Day Adventist Church, sharing his love for Jesus Christ. He is survived by his wife Sylvia Naranjo, daughters Venus (Terry) Cedillo, Amanda Naranjo, sons Leo (Tera) Garza, Charlie (Racheal) Latta, stepsons Rene (JoAnn) Cantu and Eduardo Garza Jr. 18 grandchildren. He is also survived by his sisters Patsy (Andrew) Rodarte, Irma (Richard) Cano, and Judy (Jonathan) Edwards and his brothers Candido, Raymond (Virginia), Stephen (Rosalinda), Simon, Domingo (Sylvia) and Ray Naranjo and numerous nieces, nephews and cousins. Memorial service 5 pm Sun. Jan. 20, 2019 at Massey Funeral Home. Graveside service 2 pm Mon. Jan. 21, 2019 at Fort Sam Houston National Cemetery in San Antonio.